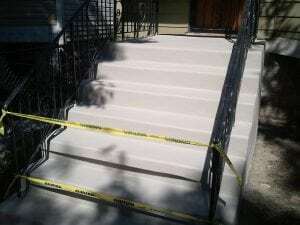 Our experienced Concrete Contractors in Chicago have many years working with concrete, they know exactly what to do to make something look as great as possible, and can complete a job to the highest possible standard in the shortest amount of time possible, all at incredibly competitive prices. One of the jobs that we are tasked with the most is concrete crack repair. Whilst Concrete is one of the most durable materials for a plethora of jobs, like most materials, it won’t last forever. Over time you may notice that cracks are appearing on the surface of the concrete. You could ignore this, but it is certainly hindering the aesthetic appeal of the concrete installation, and eventually that crack will get bigger, and that makes the concrete repairs that much more difficult to carry out. Therefore you will want to deal with the problem as quickly as possible. Our experienced team are able to quickly and easily deal with all manner of cracks in concrete, and get your concrete installation looking as great as possible again, in the shortest amount of time. We are able to carry out concrete crack repair in all types of concrete. We are even able to carry out foundation crack repair, a service that many teams do not actually offer. So why not get in touch with us today? If you wish to find out more about the Concrete Crack Repair service that we offer in Chicago and the suburbs then please do not hesitate to get in touch with our customer service team. They aim to respond in a day and will be more than happy to help you with any information that you require about the process.